Had tea this morning at a paint store across the street from where I stayed last night. Mehmet the owner, his friends Mehmet and a man whose name I can’t remember, the manager Ali, and their employee Yilmaz. The tea wasn’t ready for a while, but the company was great. Camping near a creek bed in a deciduous grove near the highway. Nicer than the pear orchard. More rustic, more private. 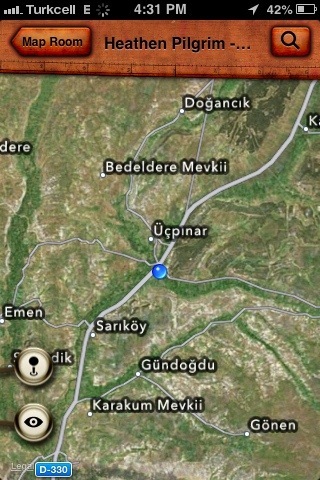 I’m about 60 km (36 miles) outside of Konya. I thought there was a lot of holiday traffic on the road yesterday, but I was badly mistaken — that was nothing. About 2:30pm today it was like someone opened the floodgates and half of Konya came driving up this road. They are getting out of town, going back to their home villages for family reunions when the holiday starts tomorrow. Fortunately, road construction means I have an entire parallel road (still in the dirt stages) all to myself. Otherwise there’s no way I’d be able to go up against this steady stream of cars. Today’s walk went pretty quickly. There weren’t many places along the way to stop and rest, have a cup of tea, chat with the locals, etc. Actually, there were none. So I rolled into Sarikoy, my originally-intended destination village, more than an hour earlier than usual, even though I didn’t get a particularly early start this morning. The village was set back from the road a few hundred meters, so I asked a family down at the road if the village had a bakkal (a corner market). I asked because I was looking for food and water, yes, but also because I prefer to let the locals direct me into a village that’s off the main road, rather than entering the village on my own without permission. The answer to my question, “Is there a bakkal,” was “No, we buy everything at the carsi.” “Carsi” is a broad word meaning market, or bazaar, or sometimes even the commercial center of a town. It’s one of those words that means a great deal to the locals, and absolutely nothing to everyone else. This was a pretty small village. It looked to be only a few hundred people. So I would not be surprised if there was no bakkal. But there was a lot of interfering background noise — honking geese, passing cars, etc. So I asked again. Was there a bakkal? I added that I was just looking for water (I held up my empty water bottle) and a little food, thinking maybe they’d offer to fill my bottle or hand me a piece of fruit or something. No such luck, but this time the older woman said there was in fact a bakkal, but it was closed, and would not open for another hour and a half. This was unusual. Yes, there have been times I’ve walked into a particularly small village in which the one bakkal was not open all day. But whenever that had happened, another villager, usually a young boy, ran over to pull the bakkal owner back to work. She pointed to the center of the village, off the main road and up the hill a few blocks, so I started walking up that way. I stopped at the mosque to rest up a bit and wait until the bakkal reopened. After about 20 minutes hanging out at the mosque I decided to walk up to the bakkal anyway. I shouldered my pack and walked out onto the street, almost getting run over by a small boy and girl chasing each other around the village. They stopped dead in their tracks, mouths wide open, staring up at the giant humpbacked stranger walking through their village. Some older boys nearby laughed at the little kids’ shocked expressions. I greeted the older boys and asked if there was a bakkal nearby. They said of course, there’s one just up the street, follow us. We got to the bakkal, which was open and had been so all day. It was manned by a 35-year-old man named Fatih. I asked Fatih bey if there was any water, a softball question if ever there was one — I have never seen a bakkal that did not sell water. 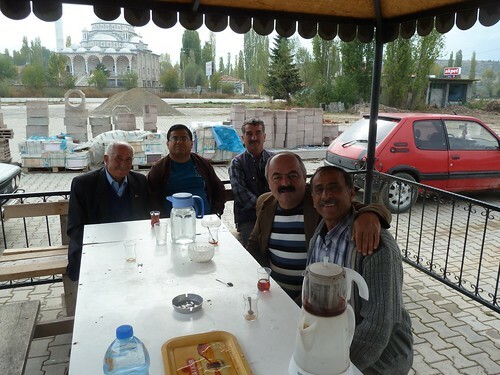 However, Fatih bey said no, we don’t sell any water, we get it all from the town’s fountains. I bought a loaf of bread and a small carton of yogurt and asked Fatih bey if there was a place I could sit and eat. He pulled a carton of sugar cubes out from under one of the shelves, dusted it off, and indicated I could sit on it. I did so, and, after offering Fatih bey some of my white bread and yogurt (he declined), dug into my lunch. While I ate I talked to Fatih bey about life in the village. He was from the village, the only child of his family left after all the other brothers and sisters had moved away to the cities. 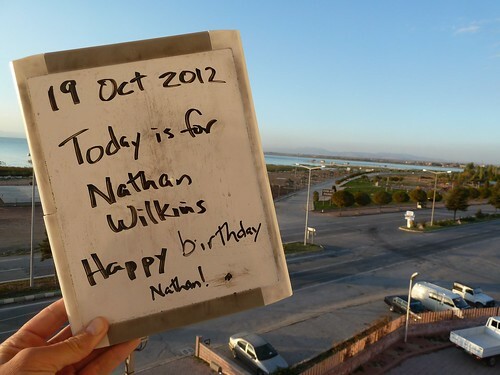 He was married with a couple kids, and was looking forward to celebrating the upcoming holiday with friends and family. I asked him some questions about slaughtering the sheep, but I couldn’t understand his accent very well and so had no idea what he said when we talked about anything but the most familiar and well-worn subjects. Fatih told me numerous times he liked village life, that it was quiet and relaxed, not noisy and stressful like life in the cities. I asked him how business was at the bakkal. He said the bakkal wasn’t doing very well. I was not surprised, given that some of his fellow villagers were barely acknowledging it existed, and when they did they thought it was closed when actually it wasn’t. When I finished my loaf of bread and carton of yogurt Fatih bey cut me off a piece of homemade helva (a popular tahini-based dessert). I used to not like helva much. I don’t know whether I’m acquiring a taste for it or what, but this was some of the most delicious helva I’ve ever tasted. It was all I could do to show restraint and not keep asking for more. At this point I went for “the ask,” that time in the conversation when I directly ask if there is a place in town where I can camp for the night. Everything is in my pack, I say. Tent, sleeping bag, everything. All I need, I say, is a place to lay it out — a mosque garden, an empty room, whatever. Fatih bey said no, unfortunately, probably not here in this village. We are too small, he said. Our mosque does not have a garden (true — what garden there was had been entirely covered in concrete), and there is no school or park. Fatih bey suggested I walk up the road a few kilometers, where I would find a gas station and a rest area to camp in (that is, in fact, where I am now). When people say no to me, the most common thing they cite is their village’s lack of facilities. I want to counter that if they had seen some of the places I had considered acceptable places to sleep, they’d be amazed. A hard tile floor in the corner of a gas station’s office. A spare, unlit storage room. A dirty orchard on the side of the road. But then I realize none of this information would change what they had to say even slightly, because they are not saying no because of the reasons they are giving, they are saying no because of something else, and that something else quite likely has absolutely nothing to do with me. In the earlier days of this trip I thought the results of my requests for a place to stay were driven by my approach, in the way I asked, in who I asked. When I began to realize the results had little to do with me, I thought maybe they had to do with the venue — was there a patch of grass somewhere, for example? But for every place that has turned me away for not having a patch of grass, a place without a patch of grass has welcomed me warmly. So then I thought maybe it was the size of the village. Maybe a village that couldn’t support a bakkal couldn’t support visitors. But for every tiny village that couldn’t support a bakkal that has turned me away, another tiny village that couldn’t support a bakkal has taken me in. Every time I think I’m starting to see a pattern, I realize there is also data to refute it. At the beginning of each day, I do not know what the end of the day will hold in store for me. In fact, at 3pm, when I typically walk into that day’s intended destination village, I have absolutely no idea what kind of reception I will get. I have been shown to the imam’s living room. I have been shown to the town’s vehicle maintenance yard. I have been shown to the mayor’s office. I have been shown to the mosque garden. I have been shown to the hard-tiled floor of a gas station’s office. I have been shown to a cheap hotel. And sometimes, once or twice a week, I am kindly shown the exit. And almost none of it has anything to do with me. 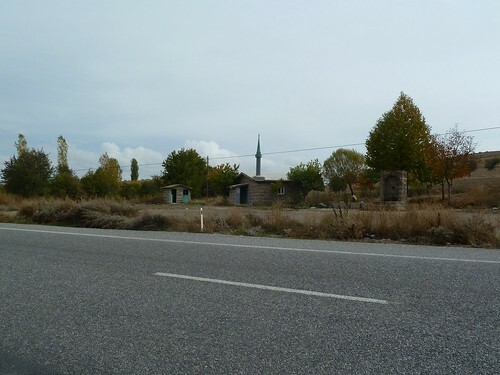 Along the road throughout Turkey are little "mini-mosques," usually uninhabited, but available in case anyone wants to stop for prayer. Mescits can usually be found at rest stops, airports, bus stations, and many gas stations. Tried to stay at Sarikoy, but flamed out there, so I’m staying at Ali Bilir Tesisleri up the road in Ucpinar. By the way, Sarikoy = yellow village, Ali Bilir = Ali knows, Tesisleri = facilities (rest stop when the context is right), Ucpinar = three springs. A shredded wire-pastry (think Shredded Wheat cereal — I suspect there’s a more culinarily-correct word for it) surrounding a disk of cheese, saturated with diluted honey and baked until the cheese is warm and melty. 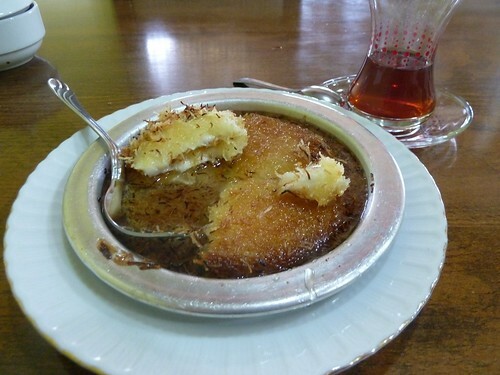 Kunefe is not a quickly-delivered dessert, since it has to bake for a bit before it’s served. So order it at the same time you order your main meal, but if you don’t, rest assured it will be worth the wait. A few days before I entered Konya province some people mentioned to me that I had to try a local specialty called etli ekmek while I was there. Thin, crisped flatbread topped with ground red meat (beef or lamb, I don’t know) mixed with ground onions and mild green and red peppers. The flatbread was much thinner than pide bread, more like lahmacun bread. The toppings were not spicy hot like most lahmacun toppings, however. It looked suspiciously like kiymali pide. I’m not complaining, because I love me some kiymali pide. But to those who have had etli ekmek before, I ask, "Was this etli ekmek, or do I need to keep looking for something else?" William Ury is a Senior Fellow at Harvard’s Negotiation Project. 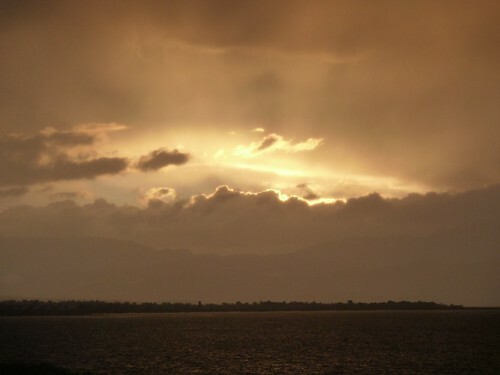 In October, 2010, he gave a speech where he mentioned Abraham’s Path, a path that follows the life of Abraham from southeast Turkey, through Syria, Jordan, and into Israel. A few months from now, I expect to be passing through Urfa in southeast Turkey and am looking forward to retracing some of Abraham’s footsteps. In fact, the 884 miles (1423 km) of walking I’m doing now, prior to arriving in Urfa, are just me shaking off what was before. Way back when, when I started planning this trip, I thought momentarily about just flying to Urfa and starting there, but then I decided that no, I would walk there. I would walk there. For some reason it was that important. The traditional way to celebrate Kurban bayrami is to sacrifice an animal, like a sheep or a cow, keeping 1/3 of the meat for one’s own family, giving 1/3 of the meat to relatives, friends, and neighbors, and giving 1/3 of the meat to the poor and needy. Even in big cities like Istanbul some people still follow this practice. The weeks before Kurban bayrami see empty lots suddenly fill with sheep families can pick out. Even outside the Carrefour (French equivalent of Walmart) across the street from where I lived in Istanbul I stepped over blood running through the cracks in the sidewalk the day before, and the first day of, Kurban bayrami. However, in most cities in Turkey the slaughtering of livestock has given way to cash donations to charities. For example, almost every other ad on TV the week before Kurban bayrami is from a charity like the Turkish Red Crescent (the Turkish version of the Red Cross) asking for money for this or that cause. This was one of my favorite stories as a kid reading the Bible in Sunday School, and when I realized Muslims, on their holiest of holidays, are celebrating the same story, that was one of my “the differences aren’t nearly as significant as we think they are” moments. There are differences in the stories (which son was nearly sacrificed, etc), but in my opinion arguing over those differences is petty internecine fighting we should “soldier up” and get over, because the point is that the three Abrahamic religions (Judaism, Christianity, Islam) celebrate pretty much the same story. A handful of people noticed the lack of posts yesterday and contacted me to ask if everything was okay. Yes, I’m fine, thanks. 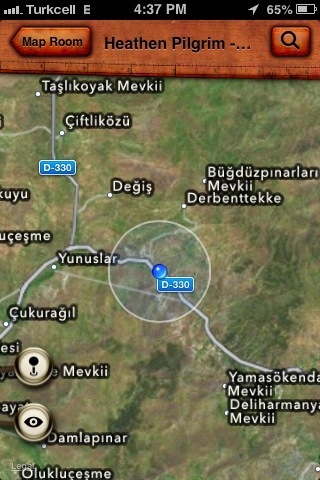 I am still in Beysehir. I was sick yesterday, so I did not walk. I am fine now, but I am taking today (Friday) off also, just to make sure. I am planning to resume the walk tomorrow (Saturday). 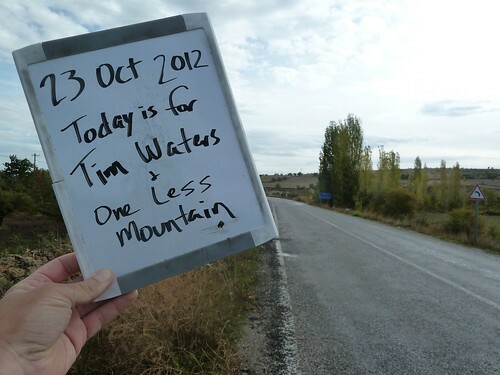 Five days of walking and then I’ll be in Konya and at the walk’s 30% mark, woo hoo! FYI, I had a case of the abdominal cramps, something that knocks me out for a few days once or twice a year. Come to think of it, I mentioned them in a chapter in A Tight Wide-open Space, a chapter that ended up being a tribute to the love and patience of my (now ex-) father-in-law. To while away the time on the road I play the license plate game. 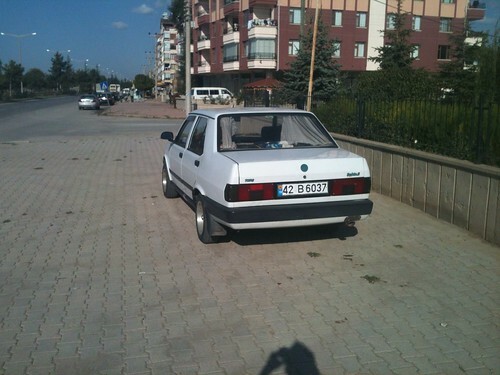 In Turkey almost all of the license plates look the same, but the first number on the plate signals which province the car is from. The numbers are in alphabetical order by province name. For example, Adana is 01, Adiyaman is 02, etc. 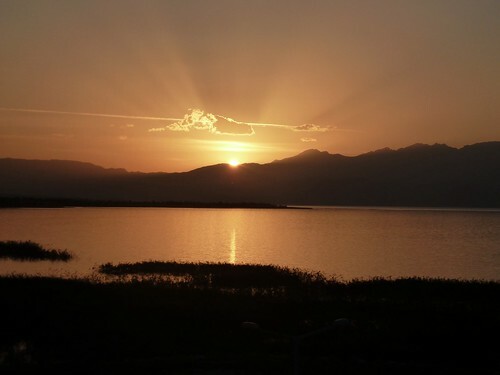 The trip started out with 09 (Aydin), then 20 (Denizli), then 03 (Afyon) for a few days, then 32 (Isparta), and now 42 (Konya). Along the way there were some 07’s and 15’s from nearby Antalya and Burdur, and on the main highways plenty of 06’s (Ankara), 34’s (my old stomping grounds of Istanbul), and 35’s (Izmir). I’ve only seen a few 01’s (Adana), but those will come soon enough. Last night, after a full day walking 40 kilometers (25 miles), double my usual, I rolled into the town of Beysehir, population 40,000. My back and hips were cramping up bad from all that walking. God only knows what possessed me to try to cram two days of walking into one. The first hotel I went to was full. The manager there drove me across town to the Ogretmen Evi (Teacher House). In Turkey most towns over 15,000 people have an Ogretmen Evi. An Ogretmen Evi is a government-run hotel officially for teachers only, but each property’s manager defines "teacher" differently, and last night, fortunately for me, the manager of this property defined "teacher" as "anyone who needs a room." Ogretmen Evis tend to be a little bit on the spartan side. Concrete walls, cement or hard-tile floors, dark hallways, etc. They also tend to be on the cheap side, price-wise. This particular Ogretmen Evi was also full. Almost, that is. 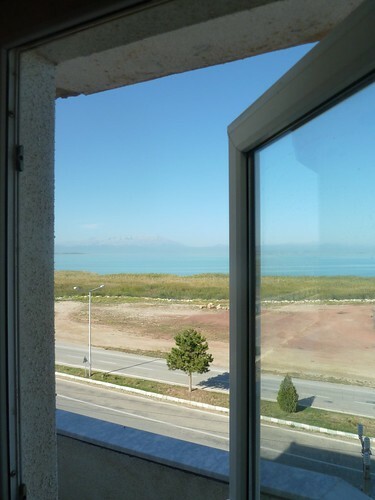 They did have one room left, the suite with lake view, which, since it was late and the place was full otherwise, the very nice and accommodating manager saw fit to give to me for the regular room price. This suite has two rooms, two overstuffed couches, a queen-sized bed, chairs all over the place, more drawers and chests than you can shake a stick at, and a bathroom with a sunken, full-sized bathtub. Breakfast is included. Twenty-four hours ago I was camping in the dirt in a pear orchard by the side of the road. Thanks Tolga for suggesting this. Say hi to everyone for me. 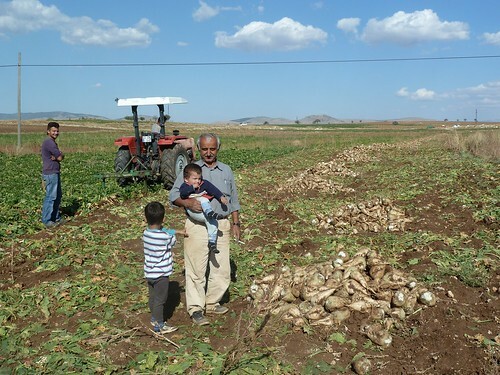 Near Lake Beysehir – Mustafa and his grandsons Selcuk (in arms) and Mustafa. They were taking a break from the harvest as I walked by. We shared three cups of tea, then they went back to work and I continued walking.